3D Printing Maker Community & Copyright Violations « Adafruit Industries – Makers, hackers, artists, designers and engineers! PDF 1 & PDF 2. 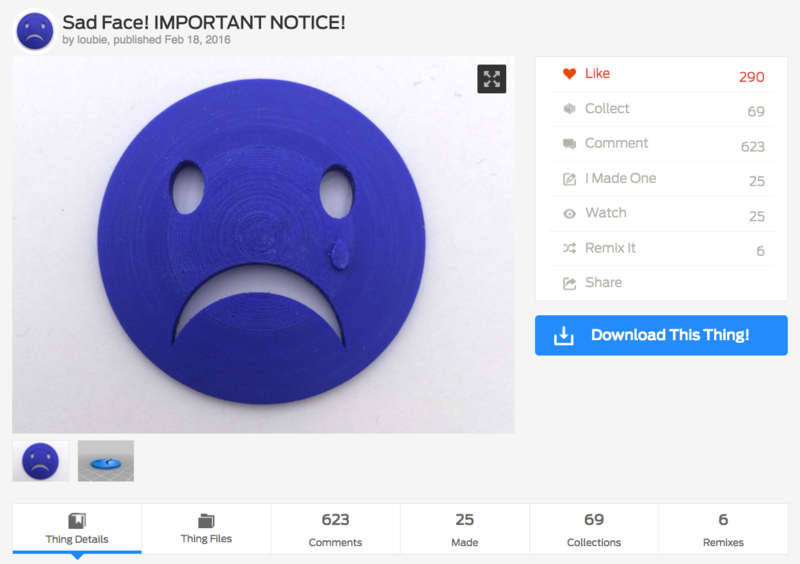 Louise Driggers, a well-known designer in the 3D printing community uploaded a model of a sad face to Thingiverse on Feb 18, 2016 with a message that shook the 3D printing maker community. 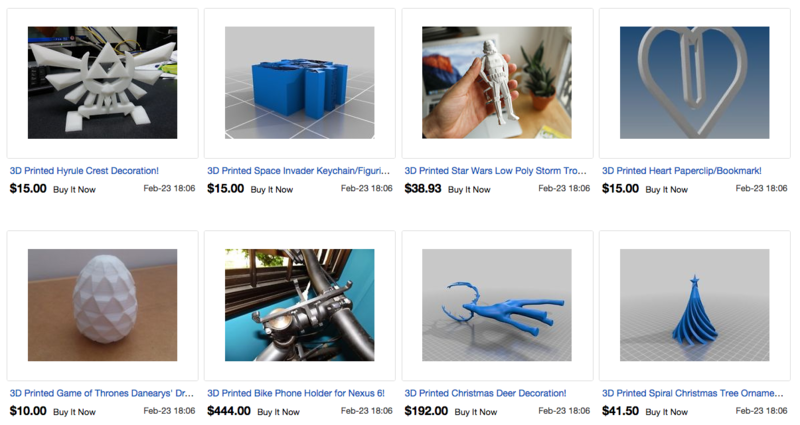 The skinny is, an eBay seller called Just3DPrint has over 2,000 items from Thingiverse listed for sell without any permission to use photos or attribution to the original designs and basically violating CC licenses. We’ve been following the ordeal since Louise posted about it on Google+. Thingiverse / Makerbot recently posted an article on their blog and said they’re investigating the situation and looking to take action on the violations. MakerBot is committed to protecting the rights of its community members. In the case of the eBay seller mentioned above, our legal team is preparing communication to the appropriate parties. Since MakerBot does not own the content that our users upload to Thingiverse, we also encourage community members who recognize third party conduct that violates their CC licenses to contact the platforms that are harboring such behavior. We are happy to answer any questions that we can at this time and provide assistance. Dozens of folks have posted makes of Louise’ “Sad Face” to show their support. We, like many others, admire and respect Louise Driggers work. 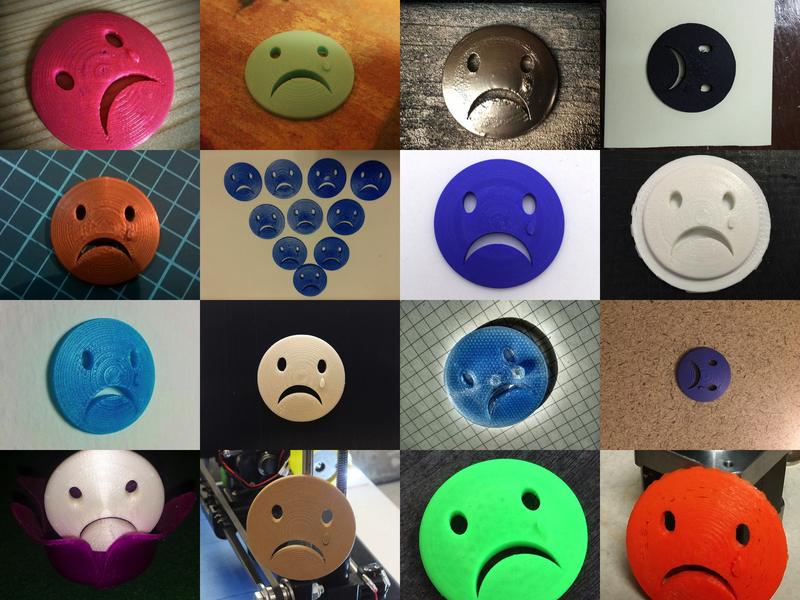 By posting sad face on Thingiverse, she used the Thingiverse platform to raise awareness and cause attention to the situation, which is a great tactic. Multiple complaints have been filed to the eBay sellers by various people and designers in the community are coming together to help stop the violations. Although Louise has succeeded in having the eBay sellers take down her Aria dragon model, there’s still thousands of stolen designs listed. We’re keeping an eye on the situation and know folks in the community are taking action.